Garage: Double, Attached "26 x 28"
Basement: Yes, Full "Partially Finished"
Open concept kitchen, dining room and living room, 1364 sq ft house on 10.07 acres of land. Straight north of Dysart on Grid Rd #639. 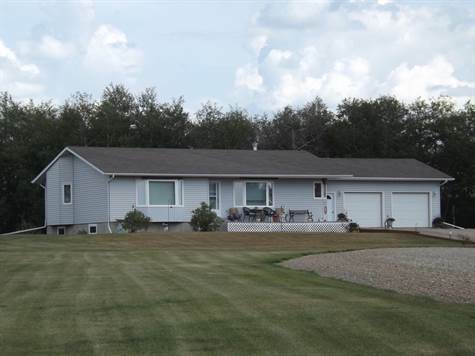 Beautiful peaceful acreage in the country, with lots of room. Garden area, deck on the front and back of the house. Basement is insulated and lined, already plumped for a bathroom, ready to be developed. The septic system and well have an alarm system to alert to any problems. 2008 Kabota BX2660 Tractor with attachments and 6500 watt generator set up to plug into furnace can be negotiated with the acreage. Everything you would need to look after the acreage. A must see to be appreciated. Call Listing Agent for further details.